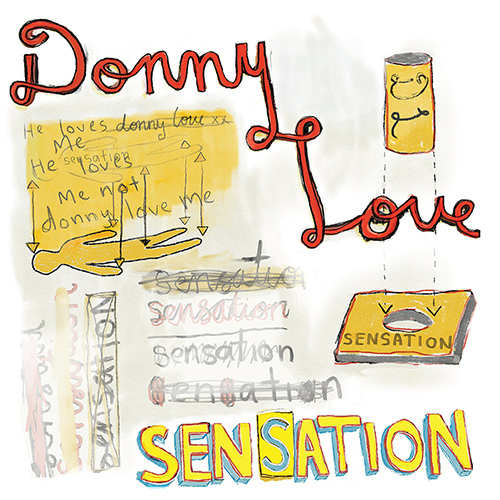 Donny Love are outsider icons of an underground detached. They’ve spent several years now brooding and maturing, mutating like discarded vegetables in the back of the refrigerator. Their long-awaited debut album, Sensation, due out May 4 was recorded at a time when the band itself seemed destined to descend, and the record was nearly lost to self-doubt and depravity. But for every member and memory lost, time and strength was gained to help them follow through on their intent. So here stands, Sensation, in all its primitive glory. Ten tracks unpacking and discarding emotions simultaneously, piling up a full plate at the existential buffet. The first song recorded in the album sessions, the 7-minute monstrosity of a title track, “Sensation”, established the conceptual basis of the record. This presents the band in all of their uncompromising innocence, blindfolded with their hands in a box trying to understand its contents. While the album’s sound incorporates carnal elements of rock, jazz, new wave and soul among other things. Lewd musings over honky keys and punchy bass lines. Poignant guitars and chugging drums. Shrieking horns and silky Rhodes. A timeless sonic palette. Important also is the aspect of place and the band engage with their Gold Coast lineage and the paradox of nocturnal motivations in the Sunshine state. You wake up with a pounding headache and a sour taste in your mouth. Furry teeth. The mattress is sunken where your lover used to lay but you rise from your bed. Facing the day you walk down the street and it’s the same sun-drenched suburban familiarity that has insulated you for so long. The boredom and banality has started to take its toll and you’ve become cynical. You take a drink and a seat in a crowded room, lost in your thoughts, in your musings on old love and youth. Your mind shifts to an anxious uncertain future, take another sip, try to be present, in the moment, allow yourself to appreciate the sensation. Sensation was recorded and mixed through a 1979 API console made for Bowie by Julian Abbott at No Wave Studio and mastered by Paul Blakey. Performed by a DL line-up which may never exist again: Don Bill, Don Harry, Don Hog, Don Ron, Don Wonton + Don T-Bone.